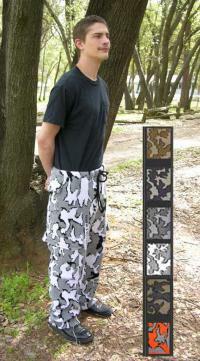 1 x 1 Rib Cuff and Hemline: Choose your Rib trim color using any of the 3 colors within your Camo Color way. 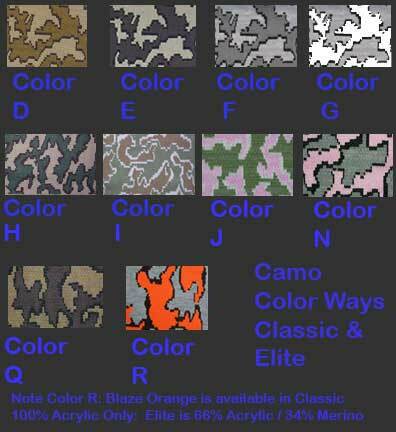 there are 3 choices for the Rib Trim color for each colorway:Color 1 is the first color listed in the camo color way camel Color 2 is the 2nd color listed in our Camo color way - the smaller Shadow color: Black in our photo, or Color 3: the third color listed in each Camo color way, bark brown in our photo. 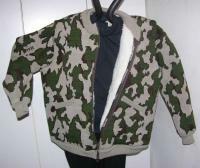 The image is shown with Color1 Camel rib trim in the E Camo color way. 1 x 1 Rib Trims with lycra at Waist cast on and Cuffs 1/2"
Fiber: 34% Merino Wool with 66% Acrylic to make an Average Weight Fabric. This is Winona's Elilte Fabric. Blending of these two fibers makes a great fabric: warmth with plyable drape for body movement! We really enjoy getting special requests from our clients to fill their personal knit garment needs. We had a request for a standard crew neck which have a tighter fit ribbed collar on the neckline and rib cuffs. 1 by 1 rib has a tighter fit then the 2 x 2 rib. So Here it is!!. This neckline is soft, warm and comfortable next to your skin. The style is selected to give a comfortable fit. Each sweater is individually hand loomed and assembled. It is NOT a mass produced item. 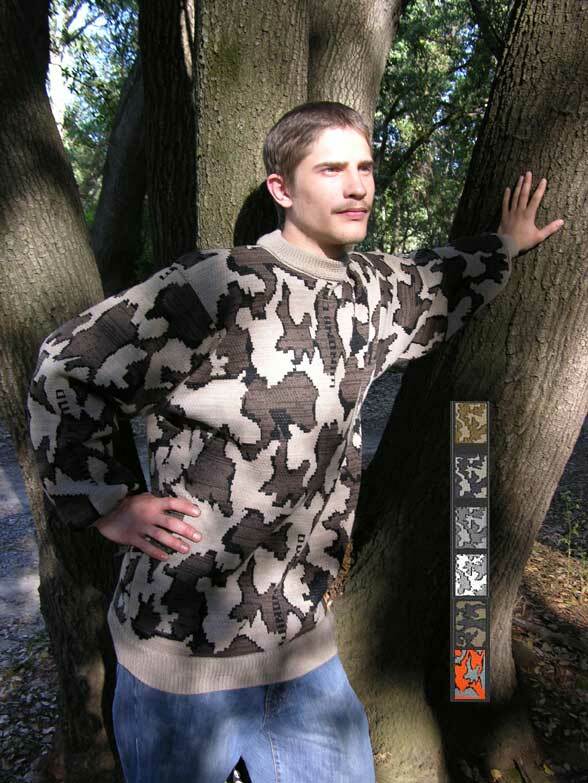 We offer this sweater under 'special order' so that you can select your size and color way to meet your hunting surroundings! or if it is just a 'style statement' for personal wear. Please allow two weeks to have this sweater especially knit for you. We will email you with an estimate of the shipping date or you can contact us if you have special needs. There are many color ways all handloomed with the 3 color camo jacquard pattern and wool/acrylic yarn blend. Click Here to see a View of some of the Merino Wool / Acrylic Camo Color Choices for these camouflage sweaters. We try to complete these Custom Orders within two weeks. 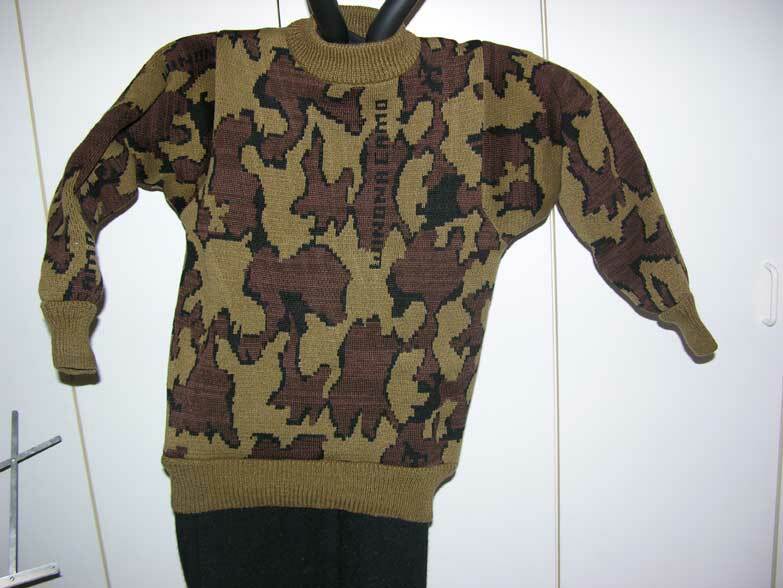 Remember to allow two weeks to have this special order camouflage crew neck sweater knit especially for you! If you are unsure of what size you want, measure a sweater style garment that you own and use that as your guide. Submitted by Emailed in Review on Fri, 08/09/2013 - 20:00.